Dave Brown‘s exhibition of intimate comedy portraits, Tough Crowd, will be leaving its current home in Norwich and heading to North Wales next month. The exhibition will be moving to Oriel Colwyn from 21st October, and it’ll remain there until 4th January 2014. The collection includes stunning images of a number of big name comedians, including a bevvy of TVO regulars: Alice Lowe, Arnab Chanda, Barunka O’Shaughnessy, Dan Clark, Dolly Wells, Joey Page, Julia Davis, Julian Barratt, Kevin Eldon, Kim Noble, Neil Cole, Noel Fielding, Rich Fulcher, Richard Ayoade, Sarah Kendall, Steve Oram, Tom Meeten and Tony Law. There will be limited edition prints on sale in aid of Afrikids, so there’s good reason to get yourself down there and part with your cash. If you can’t make it in person, the prints are also available on the Afrikids website. Oriel Colwyn can be found upstairs at Theatr Colwyn, and admission to the show is free. For more information about the venue visit its website. 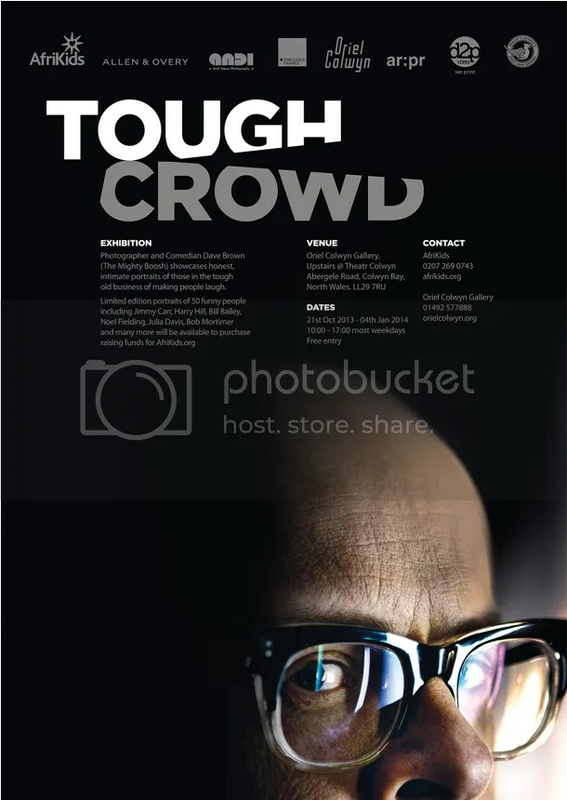 However, if Wales feels a bit too westerly for you and you haven’t yet caught Tough Crowd during its stint in Norwich, there’s still time to experience it at Flint Hair on Benedict Street and Fabulous Frames on Upper St Giles Street before it moves. Its Norwich run finishes on 12th October. Don’t forget that you can also see Dave’s brilliant photos of The Boosh at Proud Camden, London NW1 from 24th October to 1st December. It’s not yet on the venue’s website, but it’s definitely happening.